■ Describe how organisms obtain energy for life. ■ Explain how organisms interact. ■ Recognize that every organism occupies a niche. Obtaining food, shelter, and other needs is crucial to the survival of all living organisms, including you. Figure 12 Green plants, including the grasses that surround this pond, are producers. 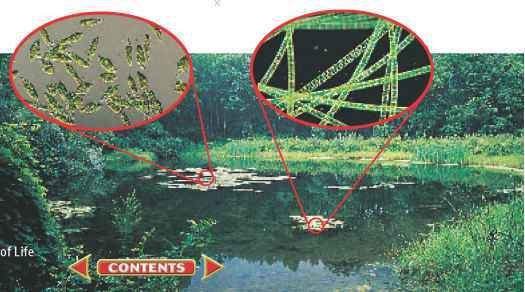 The pond water also contains producers, including microscopic organisms like Euglena and algae. Just as a car engine needs a constant supply of gasoline, living organisms need a constant supply of energy. The energy that fuels most life on Earth comes from the Sun. Some organisms use the Sun's energy to create energy-rich molecules through the process of photosynthesis. The energy-rich molecules, usually sugars, serve as food. They are made up of different combinations of carbon, hydrogen, and oxygen atoms. Energy is stored in the chemical bonds that hold the atoms of these molecules together. When the molecules break apart—for example, during digestion—the energy in the chemical bonds is released to fuel life processes. Producers Organisms that use an outside energy source like the Sun to make energy-rich molecules are called producers. Most producers contain chlorophyll (KLOR uh fihl), a chemical that is required for photosynthesis. As shown in Figure 12, green plants are producers. Some producers do not contain chlorophyll and do not use energy from the Sun. Instead, they make energy-rich molecules through a process called chemosynthesis (kee moh SIHN thuh sus). These organisms can be found near volcanic vents on the ocean floor. Inorganic molecules in the water provide the energy source for chemosynthesis. Figure 13 Four categories of consumers are shown. Identify the consumer category that would apply to a bear. What about a mushroom? Consumers Organisms that cannot make their own energy-rich molecules are called consumers. Consumers obtain energy by eating other organisms. Figure 13 shows the four general categories of consumers. Herbivores are the vegetarians of the world. They include rabbits, deer, and other plant eaters. 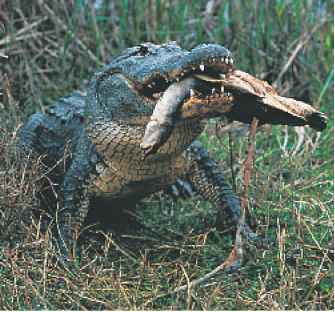 Carnivores are animals that eat other animals. Frogs and spiders are carnivores that eat insects. Omnivores, including pigs and humans, eat mostly plants and animals. Decomposers, including fungi, bacteria, and earthworms, consume wastes and dead organisms. Decomposers help recycle once-living matter by breaking it down into simple, energy-rich substances. These substances might serve as food for decomposers, be absorbed by plant roots, or be consumed by other organisms. I How are producers different from consumers? Food Chains Ecology includes the study of how organisms depend on each other for food. A food chain is a simple model of the feeding relationships in an ecosystem. For example, shrubs are food for deer, and deer are food for mountain lions, as illustrated in Figure 14. What food chain would include you? Glucose The nutrient molecule produced during photosynthesis is glucose. Look up the chemical structure of glucose and draw it in your Science Journal. Figure 14 Food chains illustrate how consumers obtain energy from other organisms in an ecosystem.